Brian Gross Fine Art is pleased to announce the opening of Robert Arneson: Political Drawings on Wednesday, October 20th. 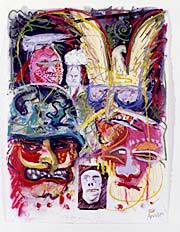 This exhibition highlights Arneson's wit and humor coupled with the skillful draftsmanship and painterly colorism of his increasingly political drawings of the 1980s and early 1990s. 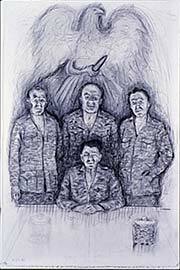 Featured are hard-hitting works from Arneson's cycle of drawings concerning the Moscone assassinations, his nuclear war works, and his Bush/Gulf War pieces. The reception and controversy sparked by Arneson's depictions of people involved in the Moscone affair marked a turning point in the politicization of his art. He realized for perhaps the first time that his art could serve as a meaningful platform for political and social commentary. Included in this exhibition are tour-de-force, large scale drawings of the key players: Mayor George Moscone, Supervisor Harvey Milk, then-Supervisor Dianne Feinstein and Supervisor Dan White. Arneson addressed the threat of global annihilation and the destructiveness of war, and often caricatured world leaders to highlight their shortcomings. In the masterful drawings, Club Social, Field Trip, and Special Forces, Arneson depicts nightmarish visions of maniacal military leaders encouraging the use of weapons of mass destruction. These expressive and spontaneous works markedly reveal Arneson's exasperation with the insanity of the arms build-up during the Reagan presidency. 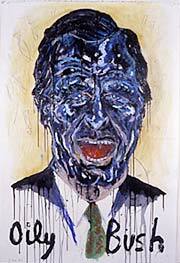 Arneson reserved harsher criticism for George Bush Sr. in Oily Bush by depicting him smiling and doused in oil. The image refers to Arneson's belief that Middle East oil was the real motivation for the 1990 Gulf War. Although some of these works were created over two decades ago, the subject matter and its implications resonate in the current political and social consciousness. Robert Arneson is most well known for his ceramic and bronze sculptures, but the artworld has known for years of his brilliance in the medium of drawing. He produced over 600 drawings in his lifetime, works that were often related to sculptural ideas and projects. This is one of the few exhibitions to date to focus solely on Arneson's drawings. Included will be works from the artist's estate, and from Bay Area public and private collections. Robert Arneson was born in Benicia, CA in 1930. 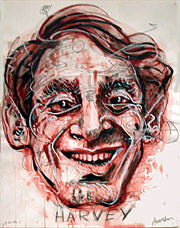 A professor of art at the University of California at Davis for 29 years, he retired in 1991, and died in 1992. Recent museum exhibitions include Arneson and the Object, organized by the Palmer Museum of Art at The Pennsylvania State University at University Park, 2004; Big Idea: The Maquettes of Robert Arneson, mounted by the Palo Alto Art Center in Palo Alto, CA, 2002-2004; Robert Arneson: Bronze Self-Portraits and Drawings, coordinated by DeCordova Museum and Sculpture Park in Lincoln, Massachusetts, 1999; and Robert Arneson: Self-Reflections, San Francisco Museum of Modern Art, 1997. His work can found be in major museums nationally and internationally, including the Hirshhorn Museum and Sculpture Garden, Washington, DC; Los Angeles County Museum, CA; Metropolitan Museum of Art, New York; Stedelijk Museum, Amsterdam, and Whitney Museum of American Art, New York, among others.